Visit two of Germany's most charming places on a full-day trip from Frankfurt. 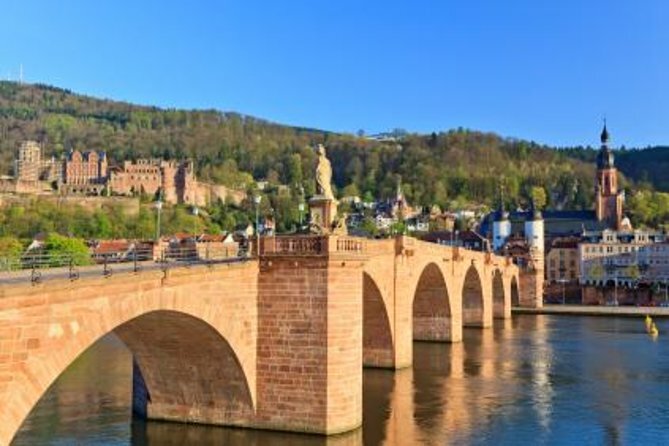 With an expert guide to show you around Heidelberg, you'll explore the ruins at Heidelberg Castle and see its medieval Old Town, the Karl Theodor Bridge and Heidelberg University. Your afternoon is spent discovering the UNESCO World Heritage-listed stretch of the Rhine River Valley, where you'll embark on a River Rhine cruise before enjoying a local wine-tasting session and dinner. After boarding your luxury coach in central Frankfurt, you'll travel approximately 50 miles (80 km) south to the lovely city of Heidelberg. Often described as Germany's most beautiful city, Heidelberg will greet you with pretty Renaissance buildings, framed by vivid green hills on both sides of the River Neckar. Heidelberg Castle perches over the city, and a visit to its famous ruins will undoubtedly be a highlight of your full-day trip. The evocative castle was created as a combination of several buildings clustered around a courtyard, each one representing different styles of German architecture. The castle is home to many interesting artifacts, including the famous Heidelberg wine barrel that boasts a capacity of more than 51 US gallons (193 liters) of wine! You'll then take a walk around Heidelberg's medieval Old Town to see the famous Old Bridge (Karl Theodor Bridge), the beautiful Church of the Holy Spirit and Heidelberg University before transferring by coach to the UNESCO World Heritage-listed stretch of the impressive Rhine Valley. See romantic villages, pretty vineyards and medieval castles that frame the River Rhine. On reaching Kaub, you'll enjoy a relaxing cruise down the River Rhine toward the town of Rudesheim, followed by a wine-tasting session and dinner. Your Heidelberg and Rhine Valley Day Trip offers the best way to experience this stunning region of Germany in a short space of time.